Vintage Made, a vintage fashion magazine app for the iPhone and iPad, is about the love of 1920 – late 1950 vintage fashion and the return to a simpler way of living. This is a free app download and then within the app users can purchase the current issue and back issues. You can download Issue 1 for $6.99. Vintage fashion magazine app for the iPhone and iPad. 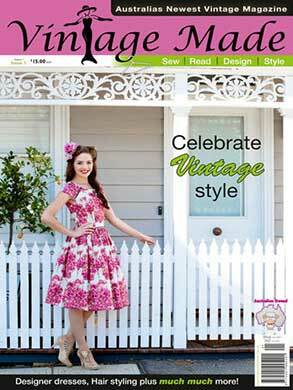 Vintage Made includes a mix of articles, tutorials, nostalgia, profiles, cosmetic and/or hairstyling tips, stunning Gallery shots and information on how to identify true vintage. Issue 1 for example, profiles Dita Von Teese, has a step by step 1950’s hairstyle tutorial, looks at the history of handbags and underwear, explains what style of hat goes with a certain face shape and takes a look at the Golden Era of costume jewelry. The mix includes 4 regular columns, around 10 feature articles, 3 tutorials and a Calendar of Australian Events. The first issue contains an overview of the 1920’s to 1950’s. All following issues will have a slightly different theme, looking at each era in more depth. Join Vintage Made on an ongoing journey through time, looking at the fashion of the decade and the moments in history that helped shape that decade. You will learn how to date clothing and accessories to a particular time period, with stunning photography and well researched information. It is all about the shared love of vintage and the evocative emotions that living vintage elicits.